Custom Printed Silicone Wristbands, Tyvek & Vinyl Bands For Events. Our lowest prices ever on silicone, vinyl & tyvek wristbands with 7 day rush available on printed bands. Or un printed vinyl & tyvek wristbands available in stock in our Auckland showroom for pickup daily, or overnight express courier right to your event. We are the best in New Zealand and we will prove it to you, just put us to the test. Are you seeking an affordable way to promote your company at a future fundraiser or function? 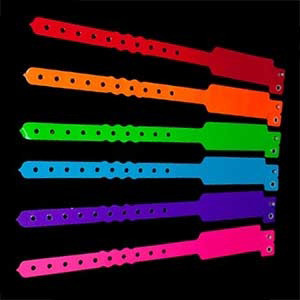 When selling tickets, why not give out some of the custom-made wristbands sold here at Dynamic Gift? As well as being durable enough to withstand all wear and tear, these items can feature your company name and logo printed in full colour on the side. Proudly tell the NZ community that you have sponsored the event through our quality waterproof vinyl and silicone products. Found in a range of materials, these promo items are suitable for both indoor and outdoor events. These custom products are also handy during the day-to-day routine of certain organisations. For example, a medical facility may need some way to identify guests for security reasons. Your company may also have regular visitors that need to be tagged while there. We can help you here by manufacturing these items with the design of your choice. Buy the best quality silicone wristbands in NZ and discover how these personalised products can help promote your company. When assisting people in remembering the name of your organisation, you can even include extras such as added USB drives in these items! Seeing as how friendly NZ can be, it is not unusual for companies to sponsor events for worthy causes such as breast cancer, environmental awareness or something equally worthwhile. The personalised wristbands from Dynamic Gift can help with these philanthropic events by being custom-made with a tasteful message and your company logo. Hand these items out to everyone who makes a donation to show your appreciation. When worn out and about, these wrist bands will let the public know of your corporate contribution to these worthy causes. Of course, these occasions have a lighter side as well. Because of this, we ensure our promotional items can be designed with exquisite artwork that reflects the positive nature of the event as well as your company. This is especially useful when targeting the younger generation and raising public awareness in NZ. 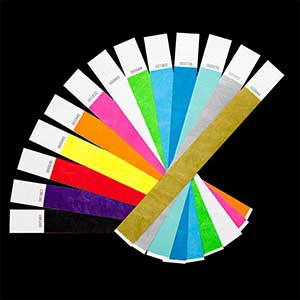 As well as durable items such as custom Tyvek wristbands, we also have a number of other products for sale such as glow in the dark and sparkle wristbands suitable for an event of any shape and size. 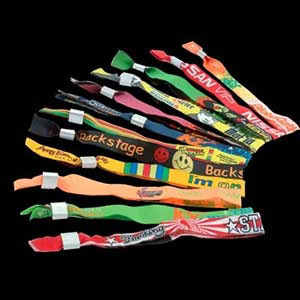 From cheap rubber models to more expensive PVC wristbands, we can cater to all budgets as well. Finally, our customised wrist bands are also suitable to boost team spirit at company days out and training events around NZ. These colourful items can also keep your staff together when touring around a strange city or countryside setting. So browse our range of plain bangles, slap bands and cotton bracelets and see which suits your needs best. These wristbands are designed to last a long time and reflect well on your company when worn out and about. From team training events to youth awareness functions, they can also provide a range of benefits for you and your business.